One of the best things about being a Washington, DC, wedding photographer is the opportunity to learn new things. Every marriage celebration that we photograph presents another chance to see how each couple observes their wedding traditions. Even sets of fiancés from the exact same cultural background will often find ways to celebrate their nuptials differently. Learning about those differences is something that keeps us energized and excited to take pictures of matrimonial events. It keeps our jobs fresh, helps us grow as people and is frankly a lot of fun! Some weddings teach us more than others, of course. The Northern Virginia wedding depicted here exposed us to some very interesting elements of Indian matrimonial customs. It was not the first Indian marriage event that we had photographed, of course. In fact, the first time that we ever documented wedding photographically was in South India. Like anyone who has ever attended marriage celebrated in according to Indian traditions, we immediately noticed the beautiful colors. Everyone, from the bride and groom to the wedding guests, was clad in vibrantly hued silk clothing. The wedding venue was similarly festooned with fabrics dyed with bright, eye-catching colors. It was a great way to get our careers as DC wedding photographers started! It was a visual feast that made for dazzling wedding photography. It also and had us looking forward to our next opportunity to photograph an Indian marriage event! Since that first wedding, we have had the chance to photograph numerous Indian marriage celebrations back home in Washington, DC. All of them (including this one) featured a similarly bright array of colors. At first, it was a bit of a dizzying blur for us. Over time, however, we started to notice some common themes and trends. A Washington, DC, wedding photographer’s job is to notice things, after all! What we noticed was that of the colors, red seemed to play the most significant role. You can see what a dominant theme it is even in this closeup photo of the bride’s hands. Her hands were not the only thing colored red on her wedding day. The bride was covered from head to toe in that hue during the ceremony. Though most of the groom’s attire was white, his pants were also a beautiful, deep shade of red. In addition, the entire stage at the Hyatt Regency Dulles upon which they tied the knot was festooned with scarlet silks. Red popped up seemingly everywhere at this particular Washington wedding celebration. As it had at the other Indian marital events that we had photographed. We decided to educate ourselves about this and learned that the color red is greatly meaningful in Indian marital traditions. 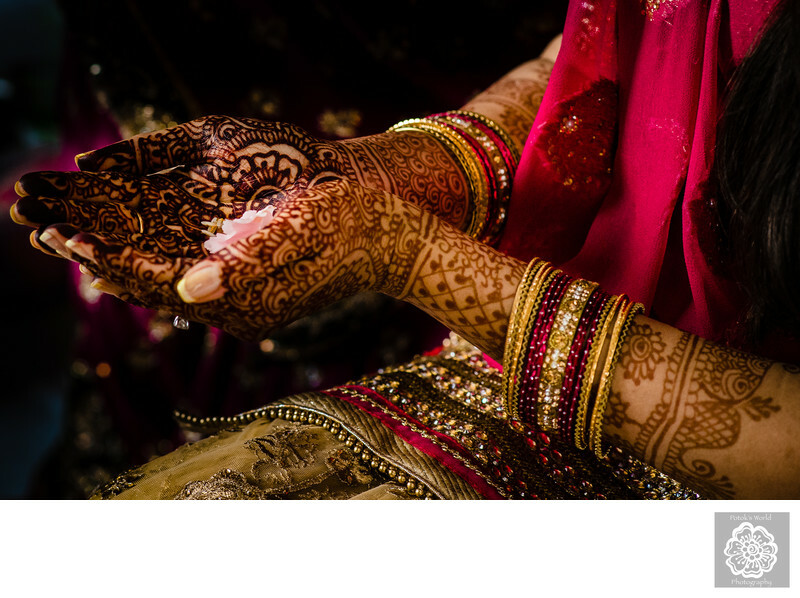 Wedding ceremonies and rituals differ greatly from one Indian state to the next. The traditions in one part of the Subcontinent often look nothing like those in other areas of India. But the use of the color red tends to be a constant. In addition to the bride typically wearing a red sari, she usually wears red holi powder on her forehead. Her wrists are also typically bedecked with bangles that match the hue of her wedding clothing. Not surprisingly, the importance of red in Indian weddings is rooted in cultural, religious and astrological beliefs. For starters, the color is considered auspicious in Indian culture and generally plays a role in any life-changing event. It is also most commonly associated with the Hindu goddess, Durga. That particular deity traditionally symbolizes power, strength, valor, purity and eternal love. Given that every wedding is a celebration of eternal love, requesting Durga’s blessings on a wedding day seems especially appropriate. Red is also emblematic of passion and fertility. That makes it an especially apt color for two people who are marrying and starting a family. Finally, red is associated with Mars. Astrology is an important component of Hinduism, and Earth’s closest neighbor is the planet that governs marriages. Location: Hyatt Regency Dulles, 2300 Dulles Corner Blvd, Herndon, VA 20171.